"Being the bike geek that I am, the annual “Bikes of the Pros” article is always one of my favorites to do. 2012 sees some new team names for existing organizations (like Garmin-Barracuda and Lotto-Belisol), some mergers (Omega Pharma-Quick Step, Radioshack Nissan Trek) and some all new organizations (GreenEDGE). As far as manufacturers lending their support to the Pro Tour, there is a good deal of diversity, with only Pinarello and Specialized sponsoring multiple teams. For componentry, Shimano and SRAM rule the roost with eight teams on Dura Ace or Di2 and seven on SRAM RED. 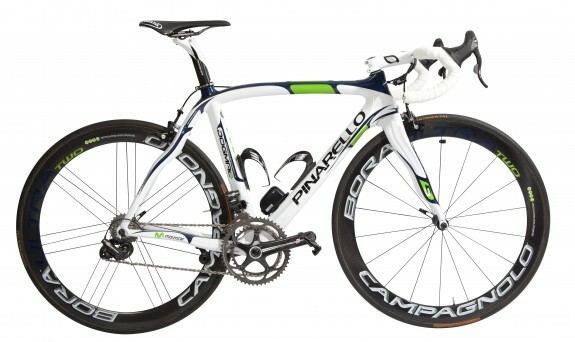 Just three teams are using Campagnolo components, with Movistar and Lotto-Belisol likely riding the company’s new electronic gruppo."